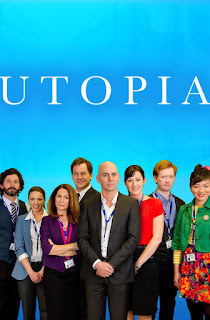 This week’s installment of Labour & Pop Culture looks at the Australian comedy “Dreamland” (also called “Utopia”) available on Netflix. Dreamland follows the travails of the bureaucrats at the fictional Nation Building Authority as they try to develop infrastructure projects, cope with their own shortcomings, and manage political interference and fads. Episode 3: The staff are directed to re-examine (one more time) a white-elephant rail project while undergoing a safety audit. Episode: 4: A new and marginal employee manages to finagle a promotion by gaming the performance assessment process with meaningless lingo and filing a grievance. Episode 12: The staff must put “meat on the bones” of a terrible, off-the-cuff policy idea while also coping with a Freedom of Information request. Episode 15: Firing an incompetent employee takes a terrible, terrible turn plus a new coffee machine disrupts the office. The crux of the humour is the effort by the two managers (Nat and Tony) to do their jobs while surrounded by easily distracted staffers and meddling political and communications operatives. Having survived a couple of years of government employment, this show nails the hard work and absurdity of it. Should Alberta protected concerted activity?